Contemporary Controls offers smoke and fire rated UL 864 Ethernet switches. The EIRX Managed Ethernet Switch and EIS Family of Plug-and-Play Unmanaged Switches are all UL 864 recognized components. The 2016 Edition of NFPA 72 (the National Fire Alarm and Signaling Code) allows the use of Ethernet as a Class N Pathway to interconnect fire alarm systems, provided the components carry the UL 864 listing. UL 864 is the standard for Control Units and Accessories for Fire Alarm Systems. Fire alarm systems must comply with stringent requirements and typically use dedicated wiring. It is unusual for a Building Management System (BMS) to perform smoke control. More commonly, smoke control is accomplished via the fire alarm system. With the advent of Ethernet based building controls, such as BACnet, and the use of an Ethernet based fire alarm, it is possible to link the two systems to monitor and control HVAC, Smoke, and Combo (Smoke and HVAC) equipment on both a day-to-day and alarm event basis. Building management becomes instantly aware of fire alarm issues and can take immediate action (dispatch maintenance, implement smoke control, apply floor pressurization, etc.). The two systems (building automation and fire safety) can remain separate but can share information for display at workstations throughout the network. Both the EIS and EIRX switches are available with a combination of copper and fiber-optic ports. This is particularly advantageous in multi-building campuses where the BMS is off-site in another building or area. Both switches support single-mode and multi-mode fibers at speeds of 10/100 Mbps while EIRX also supports 1000 Mbps. Transmission distances of up to 15 kilometers between buildings are possible. Thus, a smoke alarm at a distant location can be immediately reported to the central management system. The EIRX switch provides SFP ports allowing the user to choose the fiber ports for additional flexibility at the job site. Furthermore, the EIRX switch features management capabilities providing redundancy with Rapid Spanning Tree protocol (RSTP). 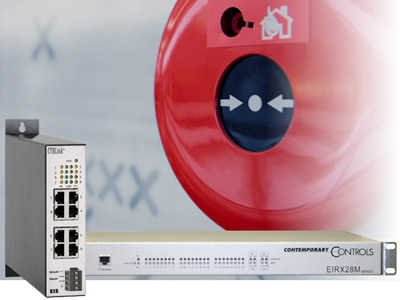 By specifying the Contemporary Controls EIS or EIRX switches as a component of their Ethernet based alarm systems, fire alarm suppliers are not required to perform additional testing on this component. Several fire alarm and security firms have already specified the EIS and EIRX series as part of their system, improving their time-to-market and their ability to offer a path to an integrated BMS for customers. Visit the UL 864 Recognized Switches page to learn more.